No drugs in the desert. 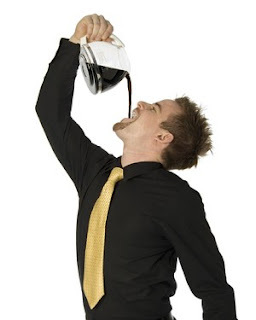 Once I gave up coffee for Lent. This was a conscious choice. I swear. After forty days of depravity it was decided by my lovely wife that I was never aloud to do it again. Allow me to explain. In the forty days leading up to Easter, Catholics enter into a time of fasting and preparation for the resurrection of our Lord. Easter becomes the carrot on the end of the stick. This is, of course, where the folklore of bunnies enters into the tradition. Catholics become so desperate for whatever they fast from during Lent that they are like rabbits ravaging a garden of carrots. Not really. Lent is a time of sacrifice. It is a desert. In going out to the desert, Christ embraced the challenges and temptations of the world and told them where to stick it. The word Lent itself is derived from the Anglo-Saxon words lencten, meaning "Spring," and lenctentid, which literally means not only "Springtide" but also was the word for March, the month in which the majority of Lent falls. Please understand, I do not consider myself addicted to any drugs. I am not a drug abuser. I choose my drugs wisely and feel that I care for them with the utmost compassion and respect. I simply like coffee. On a day to day basis I drink about four to thirty cups. Okay, more like eight. You get the picture. I felt like giving up coffee would be a real symbol of sacrifice and dedication to the season. I didn't realize that the headaches, lack of "wake-up"ability and genuine agitation would disrupt my family dynamic to the point of near incarceration. But I made it the full forty days. Bring it on. In giving up coffee, I thought my sacrifice was the reason for the season. I understood Lent to be about me and my ability to dedicate myself by giving up something. Wrong. Easter morning I drank an entire pot of coffee and returned to the daily high octane lifestyle that my wife and children had grown to love. My stomach felt like a rusted steel mill brought back to life for one weekend of production only to be shut down again by a strike on the part of my colon. Not pretty. What was Easter about anyway? Lent is not about what you give up for your sake in hopes that you can tell all your Catholic friends about your sacrifice. It is about the desert. Lent is a time to shut up. It is a designated season for creating more space in your life for Christ to be more present. It is silence when you would normally be loud. It is stillness where you are usually busy. It is calm where you bring chaos. It is Christ. Walk into the desert this Lent with a sense of confidence and anticipation for you resurrected king. If you "give something up" be sure to fill the time you would have used for that thing with time for Christ. Meet him in the sands with dedicated time and set aside reflection. Chocolate or no chocolate, I promise your Easter will be that much more of a celebration. Then, have a nice cup of coffee and enjoy the morning.